As published in An Cosantóir in February 2015. 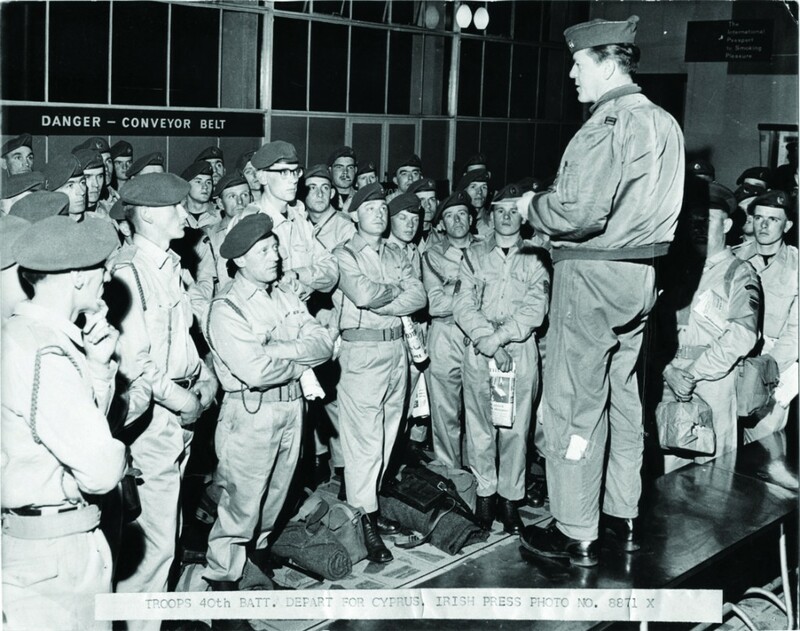 When Mick told him he had served a few years himself a great camaraderie developed, as it generally does when any two ex-servicemen or women meet up – full of humour and plenty of slagging! Despite a 40-year age difference the two guys got on great and since Mick’s release from hospital he has continued to visit Sean. After hearing the story, staff from An Cosantóir also visited Sean on a few occasions to hear his story and see how he was keeping. Sean enlisted with 4 Motor Sqn in Plunkett Bks, Curragh Camp, in January 1967; “on a wage of six pounds five shillings,” he recalls. During his time in the DF, Sean completed a Ranger’s course (in 1969 with the late Lt Gen Dermot Early as one of his instructors), experienced the early days of the Troubles, and served in Cyprus with 23 Inf Gp, UNICYP. In 1974 Sean emigrated to Australia for £25 pounds (borrowed from his sister), working for a few months in a Dunlop factory, before signing up to serve in the Australian Armoured Corps from 1975-78. 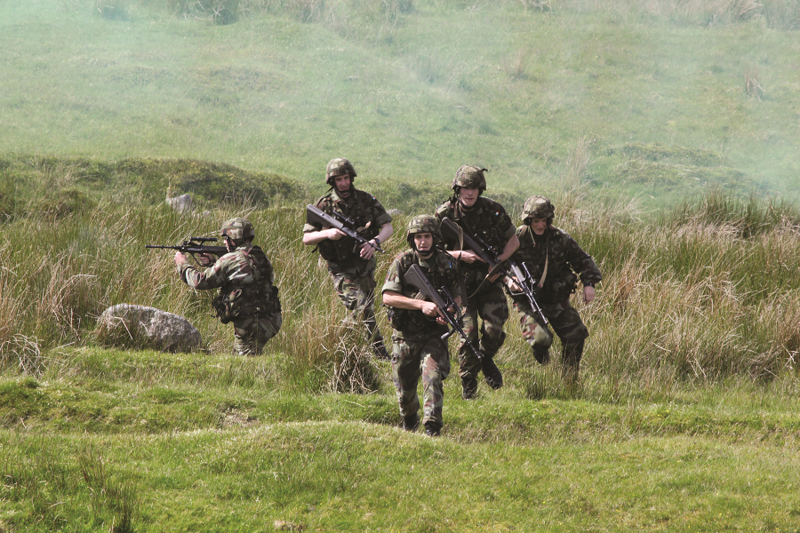 “There was a big difference from the Irish Defence Forces,” Sean says, “and even getting used to drill orders in English wasn’t as easy as it sounds.” He was issued with an FN self-loading rifle (SLR), which he kept by his bunk every night, signing out the bolt from the armoury every morning. He was stationed in Puckapunyal (Valley of the Seven Winds), central Victoria and still has his passing out parade on Super 8mm film. 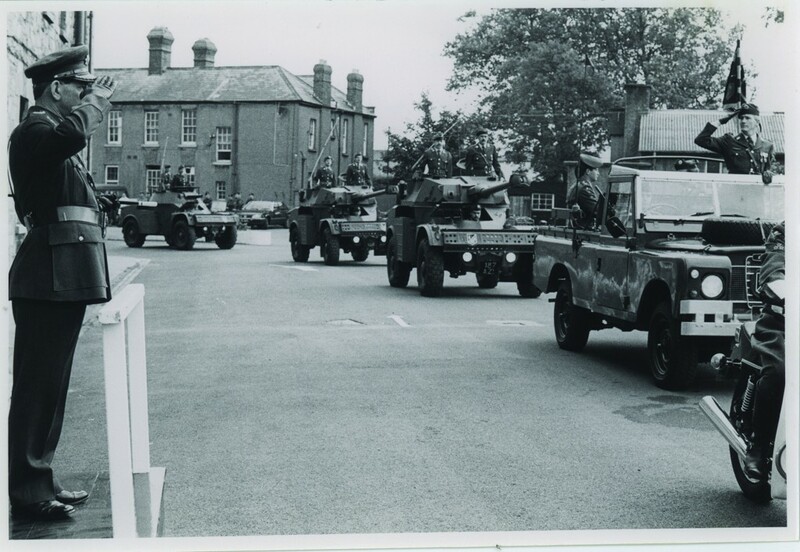 2 Cav Sqn renders the drive-past salute to Brig Gen ‘Rinty’ Monaghan (GOC E Comd), as they leave Griffiths Bks for Cathal Brugha Bks on 15th September 1988. Photo: Military Archives. 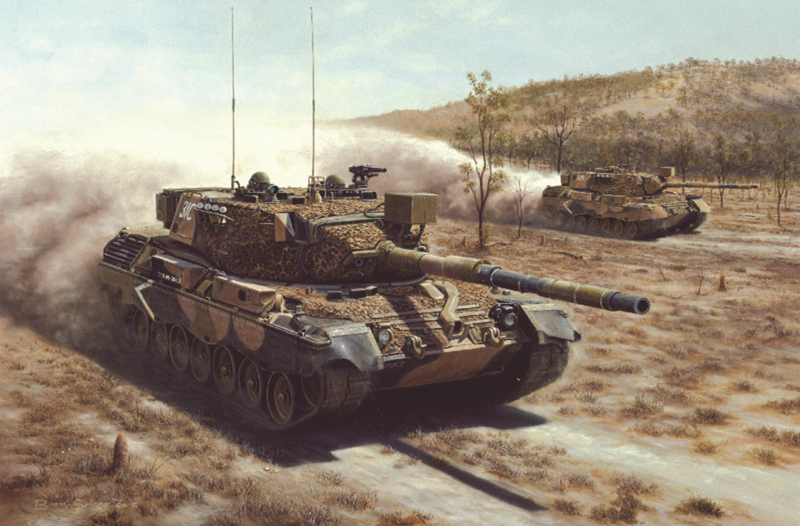 Returning to Ireland in 1978, he re-enlisted and after a short refresher course was posted to 2 Cav Sqn, Griffith Bks. 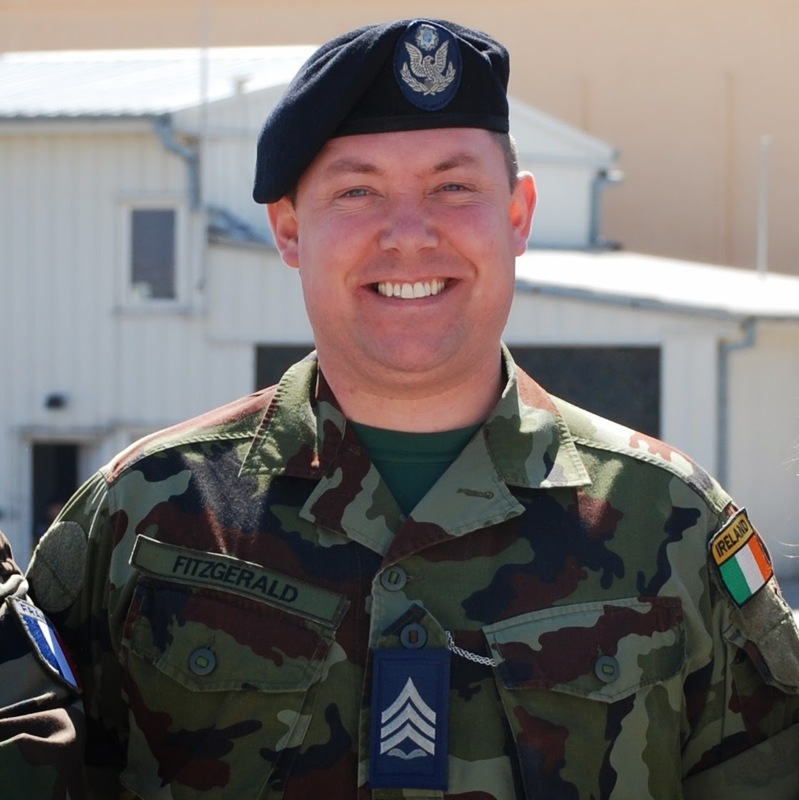 He served with 48 Inf Bn, UNIFIL, and in 1982 he transferred to the cadre staff of 11 Cav Sqn, Griffith Bks where he served, first in Griffiths Bks and then Cathal Brugha Bks, until he retired in 1993. 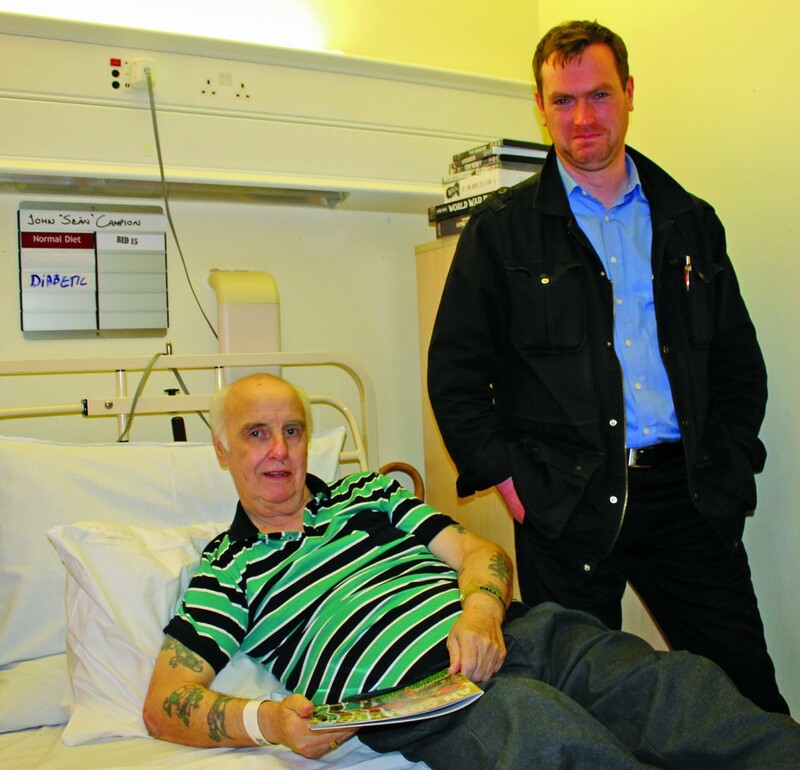 Sean was diagnosed with type 2 diabetes a few years ago and deteriorating health led to his current stay in hospital where he is recovering from the amputation of the lower half of his right leg. Nevertheless, he is in good spirits, and says he is getting healthier and stronger every day with medication, physiotherapy and great care from the hospital staff . Although wheelchair-bound at present, he is looking forward to receiving a prosthetic limb so he can get walking again. Sean keeps himself busy reading and watching movies, and has a large collection of books and DVDs, mostly military related. 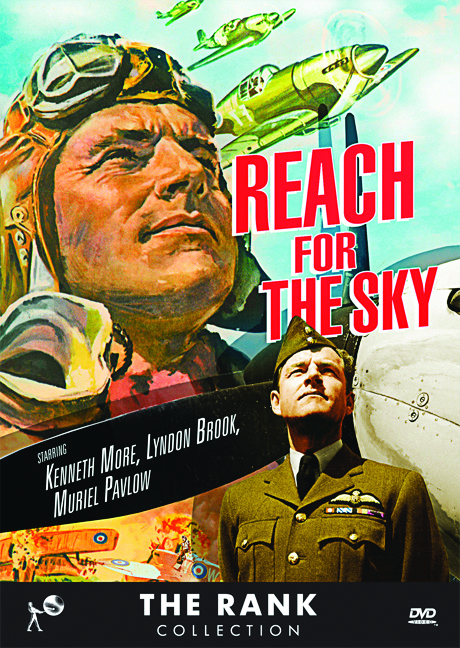 He takes particular inspiration from the film Reach for the Sky (1956), the true story of Douglas Bader, who overcame the loss of both legs to become a successful fighter pilot in World War II. During his hospitalisation, Sean has been immensely cheered by visits from members of ONEt, IUNVA, and the IDFVA. He is still warmly remembered by former colleagues and we wish him well on his road to recovery. As published in An Cosantóir in August 2011. 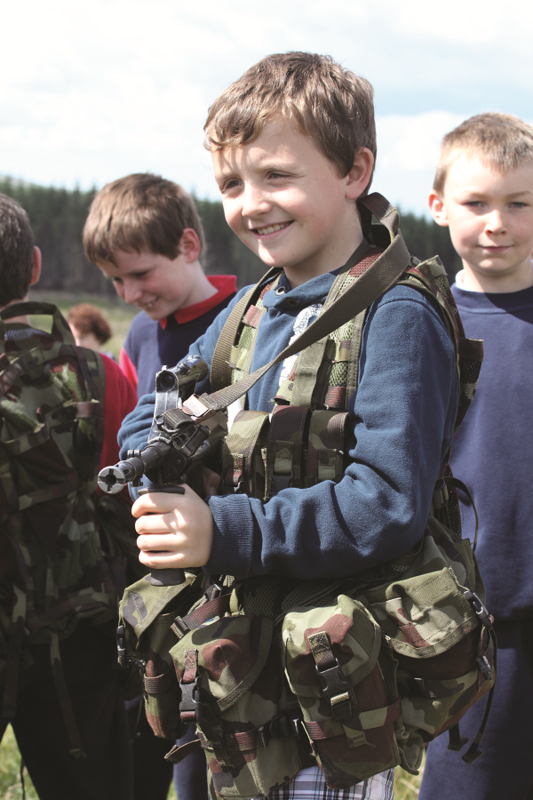 On 20th June 2011 on a lovely hot summer’s day, over 100 children gathered to watch and enjoy an open day in Kilbride Camp, County Wicklow, one of the Defence Forces’ most used training facilities, which can house up to 140 troops and their equipment. Not since the British Army were billeted in tents there in the late 1800s has the Stage Five area seen so many potential new recruits! 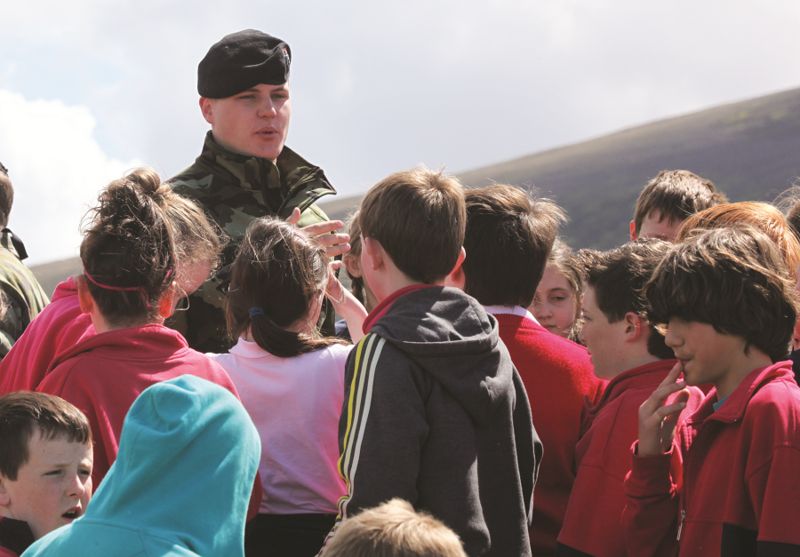 The children from the neighbouring St Bridget’s national school in Manor Kilbride were invited by the Camp Commandant, Comdt Patrick Lavelle, to view a number of military displays provided by a variety of units and corps from throughout the Defence Forces. It was hoped that these displays would give the children an understanding of what goes on in the Kilbride training area and what causes those loud bangs and explosions they may hear from time to time in school or at home. 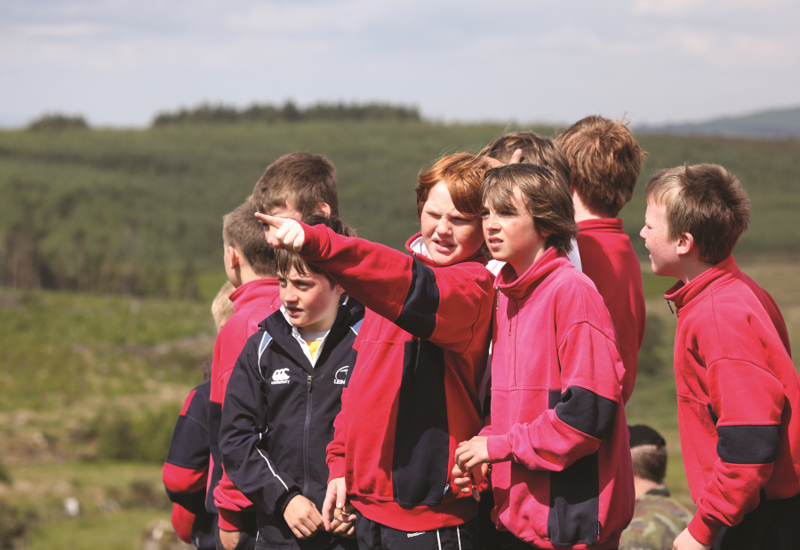 The children and two of their teachers, Ms Bernie Shorne and Ms Ciara Coakley, were guided around by the camp’s senior NCO, CQMS Patrick McKay, who gave them a safety brief and told the children to keep an eye out for any lost or wandering adults. Most of the camp staff also brought along their own small children to view the displays and to see where Daddy worked. The displays started at 11am with Cpl Clive Dunne leading his section (from 5 Inf Bn) in arrowhead formation across open ground in search of a hidden ‘enemy’. This demonstration was being explained to the now very excited children by Lt Adam Mollen (5 Inf Bn) who able fielded a barrage of questions coming rapid fire from his young audience. 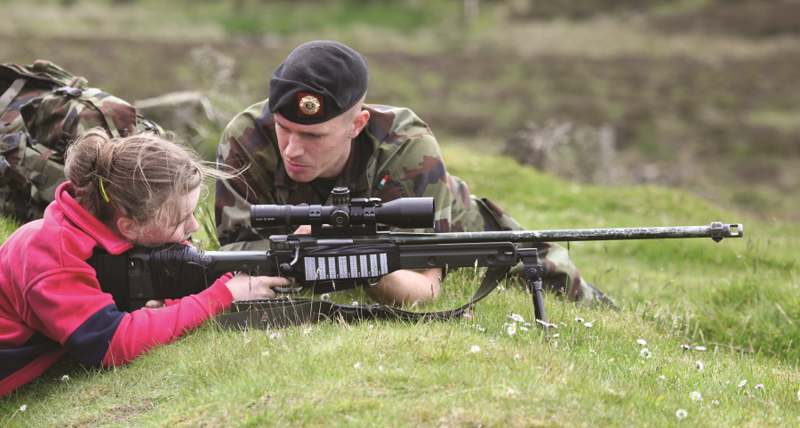 It wasn’t long before Cpl Dunne’s section came under fire from an enemy sniper. After taking cover in a nearby ditch the section carried out a left-flanking attack under cover of smoke on the enemy sniper who was being pinned down by the section’s FSG. After the fire-fight was over all the participants moved to a position in front of the children to give them a close-up view of the soldiers and their equipment. 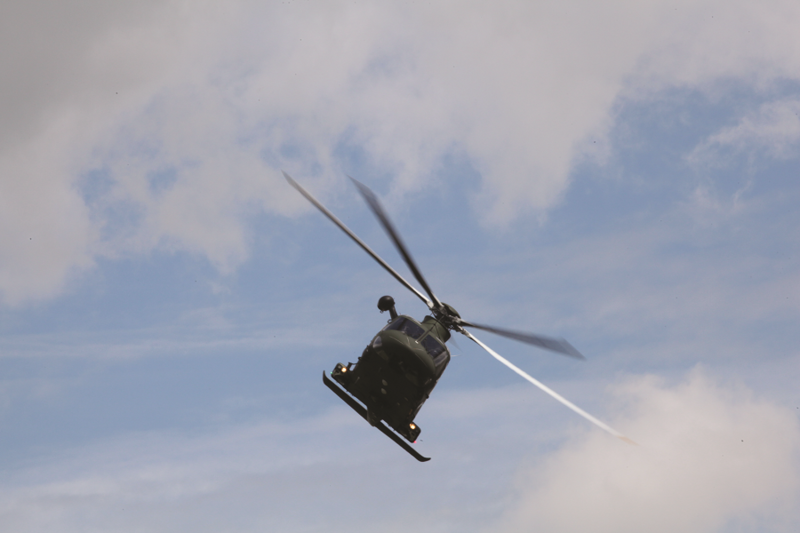 Within minutes of the end of this display an Air Corps AW139 helicopter swooped down out of the sky. The aircraft, piloted by Capt O’Reilly and Lt Hynes, whizzed into view and hovered above the viewing stand to allow the crewman, Sgt Mark Dunne, to wave briefly at the children. The ‘Wow!’-effect as the children watched this great, green beast perform some quick and exciting manoeuvres above them was clearly written all over their faces. The pilots then landed the heli in the camp on a hard stand among the other displays still awaiting the children. Also on view in the display area in the camp were a mobile EOD unit from 2 E Bde Ord Coy, manned by Cpls Carl Esmonde and John Groarke, who provided a close-up view of their equipment, and members of 5 Inf Bn with battalion support weapons and a sniper rifle system, complete with spotting scope set up for all to try. However, it was the AW139 that stole the show, with so many of the children and the adults wanting their photograph taken at the aircraft. The day finally ended with everyone being treated to a hearty lunch in the brand new dining facility, which cost €1 million to build and equip. The excellent meal, prepared and served by Cpl Ian Barry (2 LSB) and his staff, provided many different choices for their hungry young guests. As published in An Cosantóir in October 2012. On 2nd August 2012 staff from An Cosantóir visited Hamilton Park Residential Facility in Balrothery, Co Dublin. The centre looks after people with a range of health problems, including Alzheimer’s illness and brain injuries and provides pre- and post-transplant convalescent care, as well as day care and respite care. Two of the facility’s residents are retired Defence Forces personnel, Pte Oliver Reilly and Sgt Patrick Reilly (no relation). Oliver (aged 76), from Stamullen, Co Meath, served in Gormanston Camp with Tpt Pl, Air Corps Admin Coy, from1957-1980. Oliver is a veteran of 37 Inf Gp ONUC, Congo, and also served with UNICYP, Cyprus, in 1973. Patrick (aged 86) from Granard, Co Longford, served 25 years and also finished his service in Gormanston Camp, although he had a long career prior to that with 5 Inf Bn in Collins Bks, Dublin. The two former soldiers’ behavioural therapist in the centre is a serving RDF member, Cpl Gillian Dunne of A Coy, 65 Inf Bn, based in Swords. 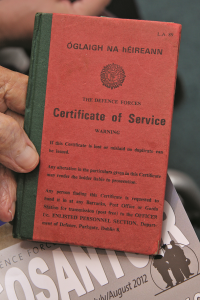 Gillian, who has served six years in the RDF, had contacted us to let us know about the two retirees who still enjoy having the Cosantóir read out to them. 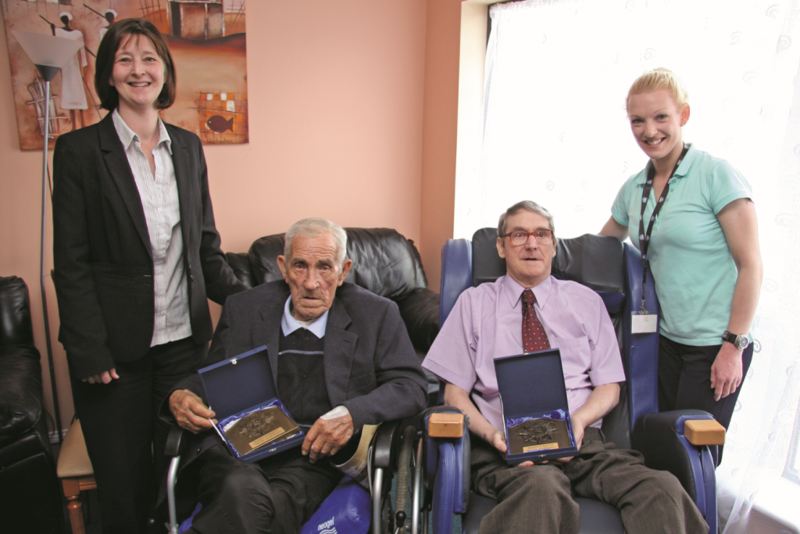 Director of Nursing, Debra Lynch, said that along with family visits, seeing us in uniform and hearing stories from An Cosantóir will help Patrick and Oliver to relive their old soldiering memories, which also helps the residence with their care. We hope our two former colleagues will enjoy this article and we send them our best wishes. As published in An Cosantóir in November 2011. Airman Michael Whelan MA, winner of the Paul Tissandier Diploma 2010 awarded by Federation Aeronautical Internationale and if that wasn’t enough he came joint second in the Patrick Kavanagh International Poetry Award 2011 for a collection of unpublished work titled ‘Against the Black Sky, We Listen: An Irish Peacekeepers Poems’. Michael joined the Defence Forces in Feb 1990 with the 36th Recruit Platoon, CTD E. He was then posted to the Admin Wing of the Air Corps in Baldonnel from 1990-94. In 1994 he was posted to Air Spt Signals and served as a Radio Operator in South Lebanon with the 75th Inf Bn, he stayed in Signals until 1997. He was successful in gaining an apprenticeship as an Air Craft Technician in Spray Painting/Panel Beating with the Air Corps College and Bolton Street from 1997-02. When he finished his trade he was posted to Engr Wing (now No 4 Spt Wing). In 2000/01 Michael served with the 3rd Tpt Coy KFOR as a Radio Operator, which was a busy time during the first free elections in Kosovo. It was in 2001 that he indulged his interest in History and commenced a degree course in Local and Community Studies with NUI Maynooth. 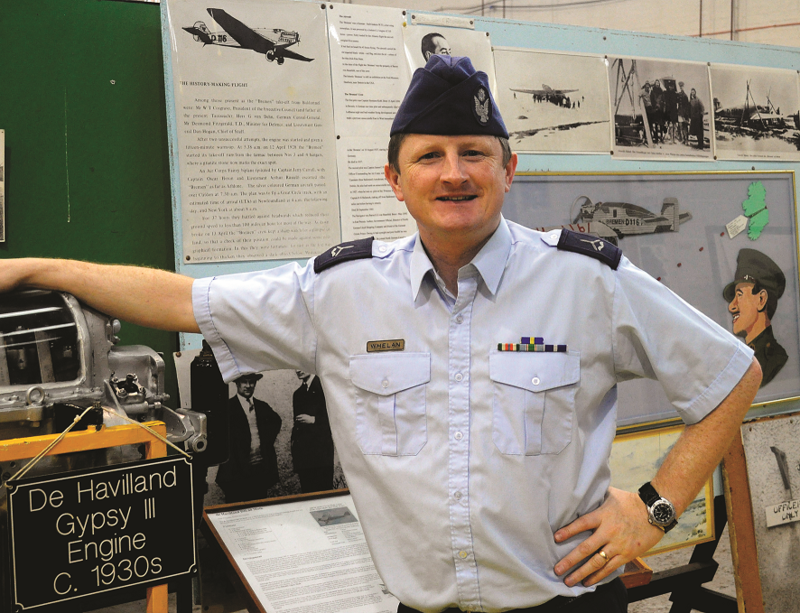 During his studies he asked the then CAS OPS – Col Paul Fry (now GOC AC) if he could start collecting pieces of Air Corps History. 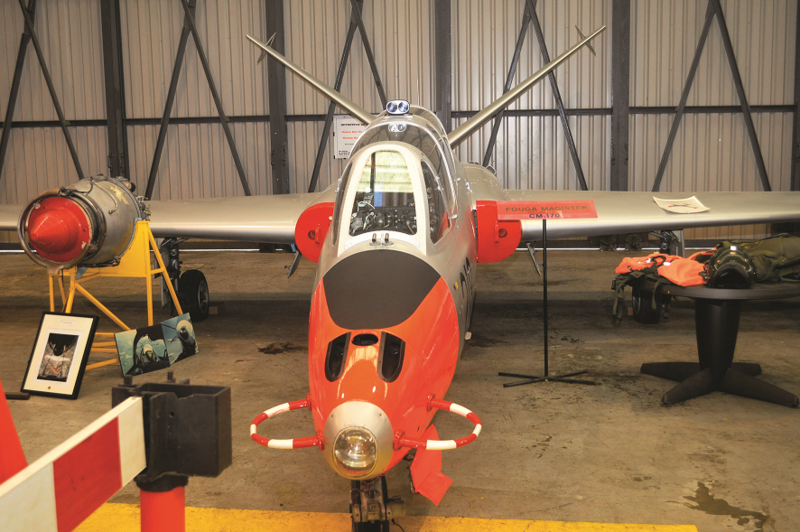 He began with a small pile of interesting artefacts in the corner of No 4 hanger and again Col Fry gave him permission to display the collection and it has grown to a now well respected and much visited collection of Air Corps aviation history. In 2002 Michael received his Certificate in Local History, in 2003 he was awarded a Diploma in Local/Community Studies and in 2005 his BA in Local History. 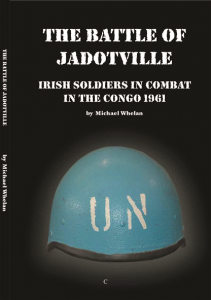 2006 saw him awarded an MA in Modern History and in the same year he wrote his first book ‘The Battle of Jadotville: Irish Soldiers in Combat in the Congo 1961’ published by South Dublin Libraries (SDL) and is a well sought after publication. During 2009 he self printed ‘On Hurting Ground: Poetic Silhouettes on Soldiers, History, Love and Tragedy,’ which is a collection of poems with all the proceeds split 50/50 between The Marie Keating Foundation and The Irish Heart Foundation. 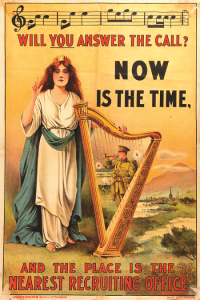 His latest offering titled ‘Allegiances Compromised: Faith, Honour and Allegiance – Ex British Soldiers in the Irish Army 1913-1924’ (2011) was also published by SDL. Michael has had his work published in too many literary magazines to mention and is a constant contributor to An Cosantóir. 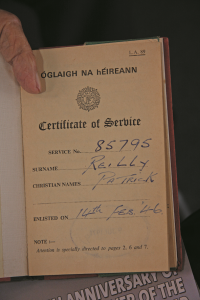 He is a member of the Military History Society of Ireland and the Military Heritage of Ireland Trust. He was involved in the South Dublin Heritage Plan (June 2011). He was appointed by the Defence Forces Chief of Staff to the Editorial Committee for the 1916 Anniversary Commemorations in 2006. United Nations 50th Anniversary of Peacekeeping publications June 2008, he also edited the 32 and 33 Irish Battalion Congo Histories (unpublished). 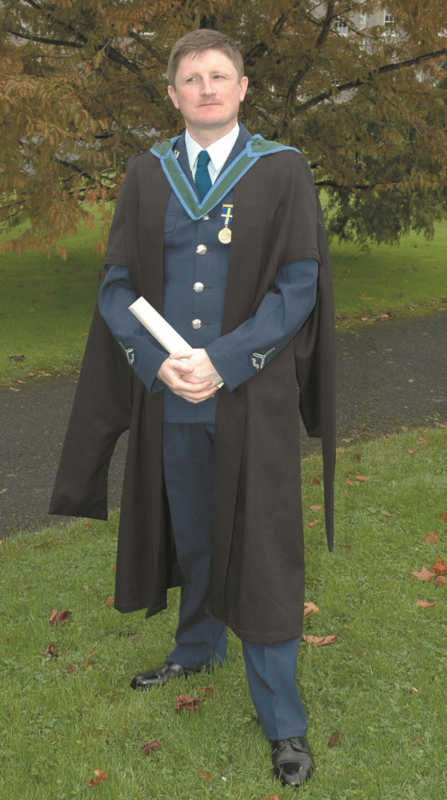 Airman Michael Whelan, nominated by the National Aero Club of Ireland (NACI) and Brig Gen Paul Fry, General Officer Commanding the Air Corps (GOC AC) was awarded the Paul Tissandier Diploma 2010 by Federation Aeronautic Internationale.